The MDKP wireless keypad can transmit a unique signal for each 1-6 digit PIN code entered. It has a built-in radio transmitter with a 250 foot range in line-of-sight conditions. It generates a separate transmission code for each user selectable 1-6 digit PIN. Codes are learned by the access controller or receiver, with the maximum number dependent upon the model used. To operate the MDKP, a user simply enters a PIN followed by the # key, and the code is transmitted to the receiver for validation. Down-lighting can be turned on by pressing the # key twice; it remains on for 30 seconds or until the code is sent. Installation and set-up are simple. The MDKP can be mounted on either a wall or a gooseneck. It is ready to use upon plugging in its 9V lithium battery and programming codes. 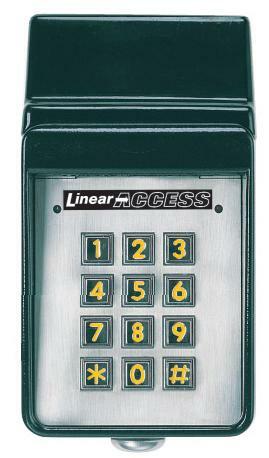 "Linear is well known for superior access control. Their keypads are seen outside some of the most prestigious homes in America as well as outside many businesses. The reason they are such a good choice for business are their flexibility in their functions. They can be used from something as simple as code entry to being a receiver for remotes to locking out codes during time frames. Even with the solid metal face they still managed to light up their keypads using a downward light from the overhanging top, making night access a snap. Each also has a key lock on the bottom to secure the wiring hookups from the curious or vandals. We take great pride in knowing our accessories and understanding how they work. The Linear Keypad has been thoroughly tested by myself and my team and meets our high standards for recommended accessories." Please don’t hesitate to call us at 1-800-537-4283 or 813-792-9412. An installation-application specialist will be waiting to assist you in every aspect of your purchase and installation.